Please stop by Abilene Animal Services at 925 S. 25th to fill out a voucher. Animal Services is partnering with Kuranda--and you, our community--to donate shelter beds for our animals. Please consider making a donation to Abilene Animal Services! 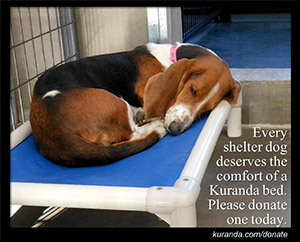 Every shelter animal deserves the comfort of a Kuranda bed. Please donate one today. Dr. Lynn Lawhon, DVM from Brookhollow Veterinary Clinic will assist with the clinic & administer the rabies vaccines. For more information, contact Animal Services at (325) 698-0085.